Click Here to download this article in a printer-friendly format. 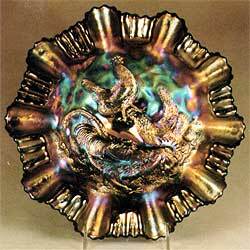 These major makers of Carnival glass were largely unknown until a few years ago. It was the research efforts of Bill Heacock that has enabled these Companies to take their rightful place among the giants of the Carnival industry. 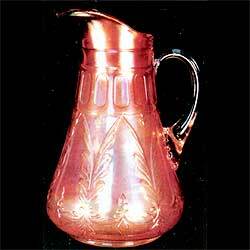 Much of the glass previously attributed to Northwood was, in fact, produced by Dugan or Diamond. This early confusion resulted from the fact all three Companies operated at various times from the same plant in Indiana, Pa. Northwood operated there from 1896 until 1901. The factory was then sold to the National Glass Company who in turn sold it to Dugan in 1904. Dugan operated the plant for nine years (1904 to 1913) before selling it to Diamond. Diamond produced glass at this site for the major portion of the Carnival years, but the depression resulted in the plant’s closure in 1931. Northwood’s brief tenure at the Indiana location was long before Carnival was made. So even though the Carnival shards found at the site of this factory were often from known Northwood molds, it is apparent they were used by Northwood for various types of glass other than Carnival. I have often wondered if the unsigned pieces we attribute to Northwood were, in fact, produced by Dugan or Diamond from the old Northwood molds after the logo was removed. In any event, it makes for a lively discussion, even though you run some risks of bodily harm from avid Northwood collectors. In most cases it is impossible to pinpoint the precise year an item was made. This is why we usually use the “Dugan – Diamond” designation when referring to the pieces that came from this factory during this 1904 to 1931 period. And regardless of which Company made them, they are among the most beautiful and highly prized in the entire Carnival spectrum. A look at the color insert is ample proof. Peach opal was the “big gun” in the Dugan – Diamond arsenal. I suppose 90% of the Carnival in this color was made by them. But we must not overlook their outstanding purple and also their wide range of white pieces. These three colors appear to have been their stock-in-trade. Very rarely do we find a piece of blue, green, or ice blue. As far as I know they made no red, ice green, or aqua opal. Even their production of marigold was quite limited. 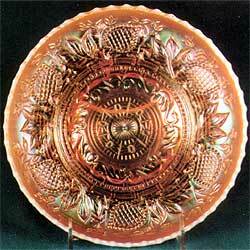 From a shape standpoint, they made many of our great plates, bowls, water sets, and punch sets. They seem not to have favored vases, compotes, or novelty items. 1. FARMYARD – It was hard for dedicated Northwood collectors to accept this as a Dugan – Diamond pattern. 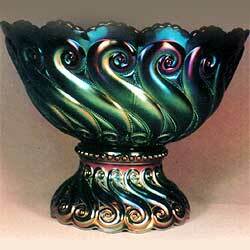 In addition to purple, rare green and peach opal bowls are also known. These bowls are found with ribbon candy edges (as shown), 6 ruffles, 8 ruffles, two types of a square shape, and a flat, round shape that turns up at the edge. These all carry the Jeweled Heart as an exterior pattern. 2. FANCIFUL – This pattern was made in peach opal (as shown), marigold, purple, white, and blue. 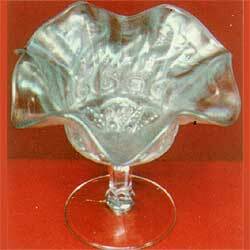 In addition to ruffled and ice cream shape bowls, it was also made in a flat plate. 3. 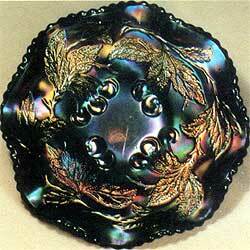 FISHSCALE AND BEADS – This pattern is found in 6” plates (as shown) and ruffled 6” bowls. The colors are purple (as shown), white, and marigold. The Beads portion of the pattern is on the exterior. 4. CONSTELLATION – This compote is usually found in white but now and then a marigold or purple will turn up. It carries the Seafoam (S-Repeat) as an exterior pattern. 5. DUGAN’S CHERRIES – This pattern has caused much confusion as there are two quite different versions. One version comes with a collar base and carries the Jeweled Heart as an exterior pattern. It was made in 6” (as shown) and 9 1/2” bowls. These may be ruffled (also see photo 8) or tightly crimped. The second version is a footed 9” bowl with quite a different cherry pattern on both the exterior and interior. Marigold, purple, and peach opal are the colors usually seen on both versions. 6. MANY FRUITS – This pattern is found in marigold, purple (as shown), white, and now and then, in blue. The bowl and the base may be round (as shown) or ruffled. If the bowl is ruffled the proper base will also be ruffled. 7. 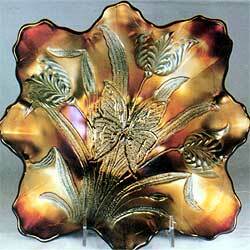 PERSIAN GARDEN – This pattern was made in 11” master ice cream bowls (as shown) and 5” individual ice cream bowls. When these same pieces are ruffled, they are called a berry set and when flattened out into plates we call them a cake set or sometimes a sandwich set. Persian Garden is also found in a two-piece fruit bowl. The colors are marigold, white, purple, and rarely in peach opal. Not all shapes will be found in all colors. 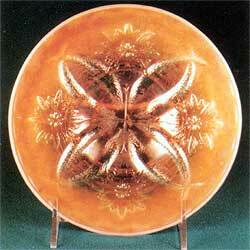 A peach opal sandwich tray (also called a chop or cake plate) sold at auction for $4,750 in 1985. 8. DUGAN’S CHERRIES (Also see No. 5) – The purple 9 1/2” collar base bowl shown here is unique the way it is shaped into 8 deep ruffles. I have not seen another one shaped in this way. 9. S-REPEAT – This is found only in purple. Now and then a punch cup is shaped into a small creamer. It was supposedly made in an old toothpick holder, but it was so heavily reproduced in various colors by St. Clair (unsigned) that I wouldn’t know an old one if I saw it. 10. 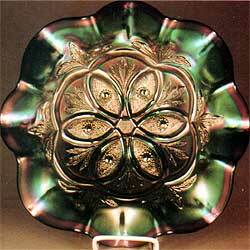 FOUR FLOWERS – The Dugan version of this pattern was made in a chop plate and individual 6” plate (as shown). It was also made in a berry set. The master berry bowl is sometimes squeezed into a banana boat shape. Purple and peach opal are the colors normally seen. 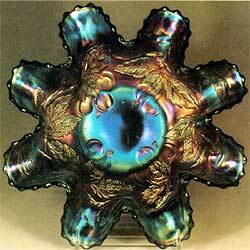 This pattern is confusing because it was copied by the Eda Glass Company in Sweden. These have a ground base and scalloped edge. 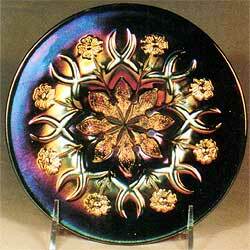 They were also made in different colors and different sizes and shapes than the Dugan pieces. 11. QUILL – Quill was made in marigold (shown) and purple water sets. All are rare, but the purple is rarely seen. 12. WISHBONE AND SPADES – This pattern was made in a chop plate and a 6” plate (as shown). When ruffled these pieces make up the berry set. 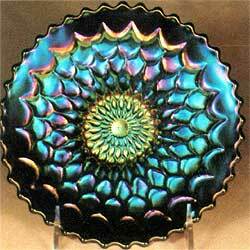 It is found in purple and peach opal, but the plates seem to have been made only in purple with the exception of one known peach opal chop plate. 13. 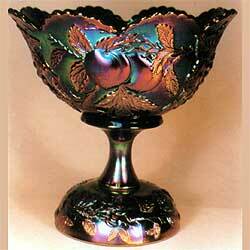 BUTTERFLY AND TULIP – This large footed bowl is sometimes flattened into a square shape (as shown). I have seen this square shape only in purple, but the deeper shaped bowls are also found in marigold. These deep pieces are ruffled in a variety of ways. Inverted Fan and Feather is the exterior pattern on these pieces. 14. 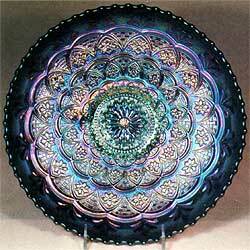 VICTORIAN – These 12” showy bowls may have 6 ruffles or 8 (as shown). Two of these are known in peach opal, but the others are all purple. This pattern has never received the attention it deserves, in my opinion. It is hoped this brief look at Dugan – Diamond will foster a new appreciation for the outstanding Carnival produced by these Companies.